Who knew clean air could be this simple? Average percent reductions of the Original DIY in 8-hour tests in a 200 sq-ft bedroom. Based on an 8-hour test in a 150 sq-ft bedroom. Does a simple fan and filter actually reduce air pollution? 1. Is the air coming out of the Smart Air DIY air purifier clean? 2. Is the Smart Air DIY air purifier able to actually clean the air in the entire room? 3. How well does the Smart Air DIY air purifier perform compared to expensive air purifiers? Conclusion: Yes, air coming out of the purifier is clean. 2. Is that enough to actually clean the air in the entire room? Answering this question is more difficult because you need a controlled environment (for example, you don’t want to walk in and out of the room during the test), and you need to test the air for a longer period of time. But fortunately for you, Thomas is a huge nerd and does this kind of thing for fun. Conclusion: Yes, the clean air from the DIY filter is cleaning the entire room. Want to know more about our methodology? If you’re a data nerd like us, click here for the full methodology. Thanks to kind souls who donated a BlueAir 203/270E (49,500 INR), a Philips AC4072 (34,140 INR), and an IQ Air Health Pro (85,000 INR) we’ve finally been able to test the DIY against expensive brands in the same room, for the same amount of time, with the same particle counter. 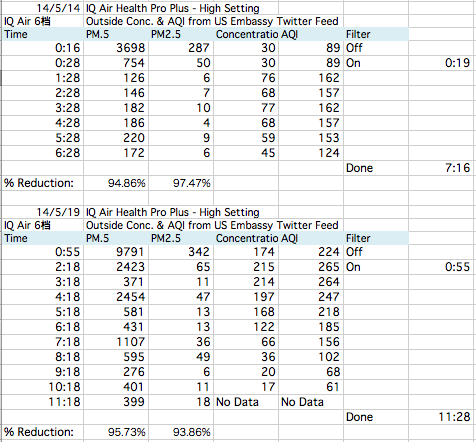 To do that, Anna ran 11 overnight tests with the BlueAir, 9 tests with the Philips, and 11 tests with the IQ Air. 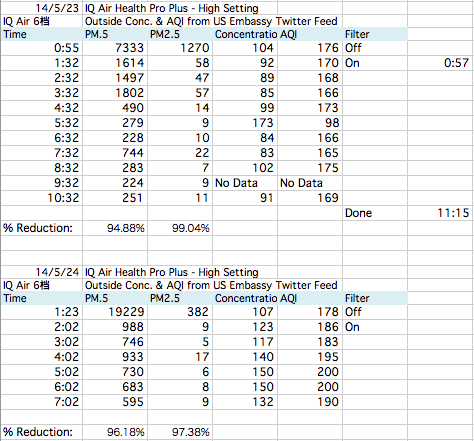 Thomas calculated effectiveness as percent reduction in particulates from the room air. 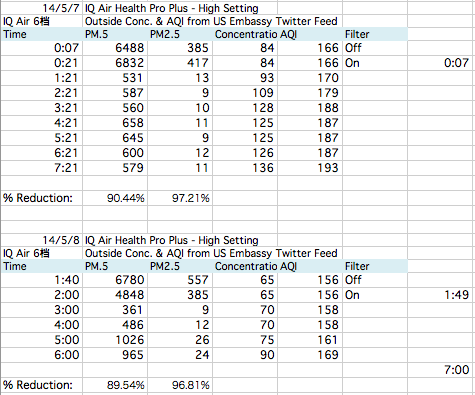 Anna tested the air before she turned on the air filter, and then set the particle counter to take hourly measurements of the air in her 15 m2 Beijing bedroom. Anna used the highest setting on each filter. 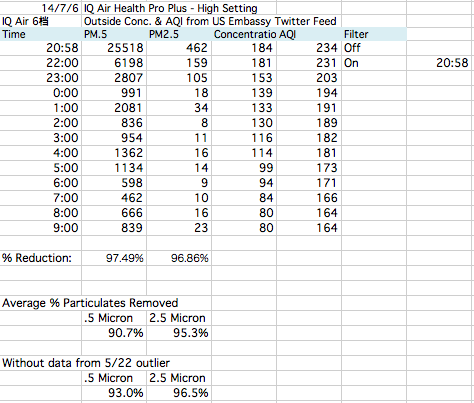 All of the filters significantly reduced particulates, but the 7,000 INR Smart Air Cannon removed as many particles as the highest-performing big brand. Even the 3,550 INR Original was only 6% behind the Blue Air on the 0.5-micron particles and 4% behind on the 2.5-micron particles. Methods: Anna turned the purifier on the highest setting before she went to bed at night and turned it off after she woke up. To measure particulates, she used a Dylos particle counter, which measures particles 0.5 microns and above and 2.5 microns and above per 0.01 cubic foot. The particle counter took one measurement each hour. Room: Anna’s bedroom is 15 m2, located in Chaoyangmen, Beijing. The doors and windows were closed while Anna slept, but she opened the door at various times at the very beginning of the test before she went to sleep. Although the doors and windows were closed, the apartment isn’t new, and the seal isn’t great. Machines: We tested an IQ Air Health Pro (8,000 RMB), Blue Air 203/270E (3,600 RMB), Philips AC4072 (3,000 RMB), Smart Air Original, and Cannon. Because we couldn’t see any reason the results were poor that night, we left the data in. If we redo the analysis with that day not included, the results are only slightly better: 93.0% of .5 micron particles and 96.5% of the 2.5-micron particles. That would put the IQ Air about equal with the Philips and still 4% below the Cannon. Have any questions about testing? Send us an email! We’re not PhDs in fluid dynamics, but we love to talk shop about clean air. Which DIY purifier is right for me? What about custom projects and business? Getting clean air needs a fan and a filter. We specialize in scaling up this simple solution for custom projects both large and small across Delhi and India. Learn more about our clean air purifying solutions for homes, offices, schools, and industry. Deliveries in Delhi/NCR take 2- 3 days, rest of India 5 – 6 days. You can always pick up your order same day from our workspace in Lado Sarai. Need clean air in your office, school, or industrial space? Get in touch or ask for a quote. (Can’t see the video? Watch it on YouTube). What is PM2.5, and why is it scary? 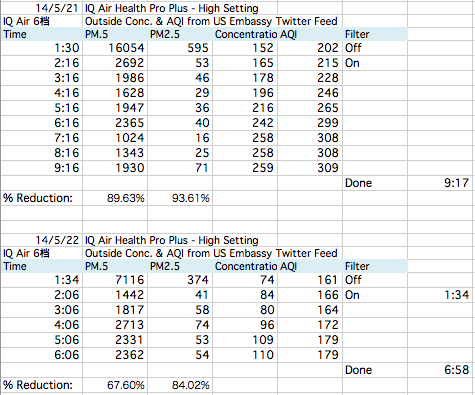 PM2.5 are tiny particles in the air that reduce visibility and cause the air to appear hazy when levels are elevated. They are any particles 2.5 micrometers (microns) or smaller. PM2.5 particles like this can penetrate deep into our lungs–some can even directly enter our bloodstream. In the long term, PM2.5 causes heart attacks, stroke, cancer, and lung problems like emphysema. In the short term, studies have shown that breathing in PM2.5 raises blood pressure, lowers heart rate variability, lowers lung function, increases blood inflammation, and causes our blood vessels to constrict. Studies have even found that PM2.5 lowers work productivity and affects our mood. How can you prevent PM2.5 from damaging your body? The best and long-term solution would be to control air pollution from cars, factories, and power plants. But until that happens, we can protect ourselves by reducing air pollution in our homes and wearing simple, empirically backed masks outside. The scientific data on masks is clear: air pollution masks work. 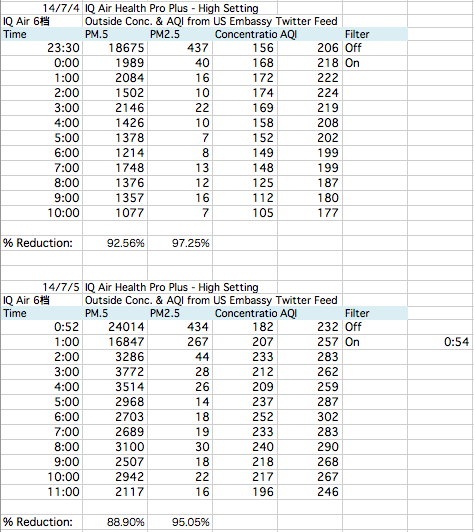 The data on HEPA purifiers is also clear: HEPA purifiers significantly reduce particulate pollution. Good, randomized studies have even found that wearing masks and using purifiers can reduce effects of air pollution on blood pressure, blood inflammation, and constriction of blood vessels. Who’s breathing Smart Air in India? Thousands of people all over India have discovered simple, cost-effective air purifiers, and learnt that clean air doesn’t have to cost an arm and a leg. Join the growing group of pollution fighters using simple, effective solutions to breath safe.